1. Hollow circles represent the C note. 2. Orange circles represent a simple pattern for the C minor pentatonic scale: C, Eb, F, G, and Bb notes. 3. Gray circles represent the rest of the pentatonic scale, outside of the simple diagonal pattern from yesterday. 4. 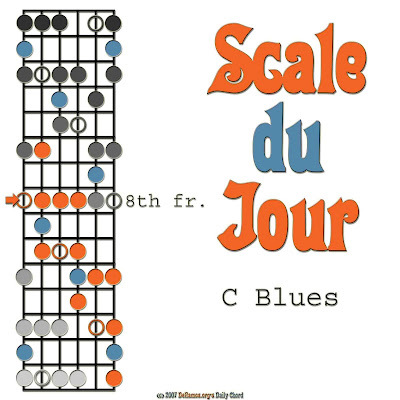 Blue circles represent the jazzy-sounding blue note of the scale: F#.